Is Global Warming Good for Wine? Some climatologists are predicting dramatic changes in the world's wine map. 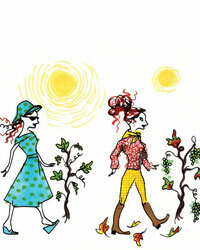 Lettie Teague wonders if Scandinavian Merlot is in our future. Much of the world may recall the summer of 2003 as the time of the deadly European heat wave and the Parisian grandmothers forgotten by their vacationing kin, but to many of the wine producers I've spoken with lately, it was the first time they truly considered global warming and its potential long-term effect on their wines. But what, exactly, might that effect be? No one I talked with seemed to quite know and neither, of course, did I. And so I set out for Hamburg in search of an answer. Though this northern German city, known mostly for its harbor and its herring, might seem an unlikely source of vinous forecasting, it's also the home of the Max Planck Institute for Meteorology, one of the world's leading centers for climate research. I had heard that one of its directors, Dr. Hartmut Grassl (recently retired), had great insights into global changes in climate and their effect on wine. I hoped Dr. Grassl might share his theories with me, perhaps over a plate of herring or, better yet, a bratwurst or two. I'd been given Dr. Grassl's name by Alois Lageder, who'd recently staged a symposium on global warming and wine near his winery in Alto Adige, Italy. Dr. Grassl had been one of the featured speakers and served on a panel that included both winemakers and scientists. The panel predicted "an incremental increase in temperature worldwide" of two to three degrees Celsius over the next century, as well as "a probable shift northward" in the world's winemaking regions during that time. That meant that places like Sweden, Norway and north central England could become important grape-growing zones, while established locations like southern Spain and southern Portugal might simply drop off the winemaking map altogether. It was snowing in Hamburg the morning I arrived, though it soon turned to a cold, steady rain. (Hamburg had been described to me as being "like London but rainier.") In other words, there's plenty of weather to study. My appointment with Dr. Grassl was scheduled for noon and I figured our chat would be conducted over lunch. I envisioned a sideboard weighed down by platters of herring and sausage, perhaps accompanied by a few terrific Mosel Rieslings from that torrid 2003 vintage. Instead, I found Dr. Grassl waiting for me in the lobby. "There's an empty classroom we can use for our discussion," he said. A trim man in his mid-60s, Dr. Grassl was wearing a snowflake-patterned cardigan. (Were all his clothes weather-themed? I wondered.) "Here we are," said Dr. Grassl, opening the door to a classroom. A complicated-looking formula was scrawled on the board behind him. "What does that mean?" I asked, pointing to the board. Dr. Grassl eyed the long string of letters and numbers. "That's an explanation of how you would formulate Newton's second law," he replied. I gave a quick nod as if to assure him that was exactly what I had guessed. As we drew up our chairs, I asked Dr. Grassl what the results of global warming would be. (I figured I'd start with the big question in case we'd soon be breaking for lunch.) Dr. Grassl nodded. We can sit in a room and talk about anticipated global changes, he said, but it could take at least two or three decades for any of those changes to happen. Did he think that winemakers should change the grapes that they are growing? I told him I'd heard that some German winemakers were increasing their plantings of Pinot Noir in part because of the warmer temperatures. (Most parts of Germany have been considered too cold to ripen Pinot Noir properly.) Others, I'd heard, were experimenting with Chardonnay. Dr. Grassl nodded. Yes, this was true, he replied; there were some varietal changes afoot. He had a saying about what might happen in the decades to come, which he recited: "Herr Merlot wird durch die Burgundische Pforte einwandern," which he translated (roughly) for me as: "Mister Merlot will come [to Germany] through the Burgundian gate." An hour and a half later, I left thinking that Dr. Grassl knew a lot about weather, though perhaps not quite as much about wine. (Merlot is, of course, the grape of Bordeaux, not Burgundy.) Still, he did have some interesting speculations, and I felt a certain frisson of excitement (not to mention a few hunger pangs) after meeting such a famous climatologist. As I traveled around Germany for the next couple of days, I mentioned Dr. Grassl's predictions to some of the winemakers I met. Were they thinking of converting their vineyards from Riesling to Pinot Noir or Chardonnay? Or, for that matter, Merlot? Walter Bibo, the managing director of the Schloss Reinhartshausen winery in the Rheingau, has planted both Pinot Blanc and Chardonnay. Yet he was concerned about hurting the Rheingau's identity as a great Riesling region. Chardonnay was everywhere, but for him, "Rheingau is Riesling." Another Rheingau winemaker, Franz Künstler, had a more positive view. Künstler actually had on hand some weather charts dating back a hundred years or so. (German winemakers certainly seemed like a weather-savvy lot.) His vineyards beside the Rhine and Main rivers didn't do well in cold, wet weather, so the hot, dry weather had been a boon for him. And what did he think of the idea of planting more Pinot Noir in Germany? "Maybe the climatic conditions for Pinot Noir are a little better," he replied. Indeed, he's started growing more Pinot Noir, presumably as a result of changing weather conditions as well as market demand. Although his portfolio is still almost entirely Riesling, Künstler makes three and sometimes four Pinots, one of which has been exported to the United States for only about a year. We tasted his 2003 Reichestal Spätburgunder (German for Pinot Noir) and it was pretty good, though perhaps lacking the complexity of a Burgundy. When I left Germany, I set out to learn how global warming might affect wine in other regions. The hot weather in 2003 had been as much a boon to some places as it had been a bust to others. For example, in France, some wine regions suffered greatly (the Loire, much of Bordeaux), while others, like Beaujolais and the Rhône (particularly the north), had a terrific year, producing many memorable wines, albeit in smaller than usual quantities. In California, 2003 was an excellent vintage for much of the North Coast, particularly for Pinot Noir, Napa Cabernet and Zinfandel. In Southern California it was more variable. Winemaker Randall Grahm of Bonny Doon in Santa Cruz was more concerned than others about the global warming trend. "A grand cru vineyard has to exist within certain climatic limits," Grahm said. "If it's too warm too often, the wines lose their elegance. A lot of vineyards in California are in too-warm sites." In some of my interviews with winemakers and weather experts, the talk turned from global warming to water scarcity. In Argentina's Mendoza region, one of the driest winemaking zones in the world, winemaker Santiago Achaval at Achaval Ferrer was more concerned about possible irrigation problems than high temperatures. As long as there was no shortage of water (Mendoza vineyards are irrigated with runoff from the Andes), Achaval seemed to feel he could cope with warmer temperatures. Indeed, 2003 was an excellent vintage for him. But, he added, he'd planted a test vineyard in one of the hottest parts of Mendoza, just to see what might happen. Evelyn Browning-Garriss, a climatologist and global weather consultant based in New Mexico, also believes that water scarcity will be an even bigger problem than global warming, at least in the near future. "What will wipe out farms and vineyards today and tomorrow isn't heat but a lack of water," she said, mentioning drought-afflicted places such as southern Portugal and southern Spain. "If you look where vineyards are located, they've often been turned over to tourist purposes"—like golf courses, which require lots of water. "The tourists, not the farmers, have the clout. In the western United States, we have a saying that 'Water flows toward the money.'" It was an interesting possibility (and perhaps a subject for a cinematic treatment—Chinatown, Part II?). But I was inclined to take what Browning-Garriss said seriously; after all, one of her longtime clients is The Old Farmer's Almanac, which has forecast weather for the United States since 1792 with a self-proclaimed 80 percent accuracy rate. Money and weather must have also been on the mind of Gregory Jones, a climatologist in the department of geography at Southern Oregon University, when he and three other scientists put together research, published in 2005, entitled "Climate Change and Global Wine Quality." The study included a comparison of vintage ratings for 30 of the world's most important wine regions in relation to climate data culled from various sources. Jones and his scientist colleagues applied a formula to this relationship: Ri,t = α0i + α1i temp i,t + β1i trendi + εi,t (which I found almost as baffling as the formula on Dr. Grassl's board). beyond the predicted optimums," i.e., gotten too warm. And while information is buried in the research, it seems that southern Spain and Portugal figure in there. Orley Ashenfelter, an economist at Princeton University, is even willing to put a price on the weather as it relates to wine. Ashenfelter has amassed a small measure of fame (and much controversy) for his studies on the relationship between weather and the price of Bordeaux, which date all the way back to 1952. Naturally, he too has an equation to calculate his findings: 12.145 + 0.00117 winter rainfall + 0.0614 average growing season temperature  0.00386 harvest rainfall. Looking at rainfall and growing-season temperature in Bordeaux, he came to a straightforward conclusion: For this region, dry and warm conditions produce the greatest wines. And though he's successfully predicted great Bordeaux vintages like 1990 and 2000, Ashenfelter, like any TV weatherman, doesn't claim total accuracy. Instead, he says his findings describe a wine's potential to be great. And that, of course, is what winemakers really care about: Will their wines be great? Will the weather make it possible? I turned again to Evelyn Browning-Garriss. "Will there be more years like 2003?" I asked her. "I wouldn't be surprised if we see the same sort of heat wave happen again and again over the next 25 to 30 years," she replied. "Perhaps as often as every three to five years." That might be great news for Germany of the Rhône, but it didn't sound like the kind of news winemakers in other places wanted to hear (not to mention all those grandmothers in Paris). And yet no one wanted to make any conclusive statements about what would happen because of rising temperatures. Will Merlot really take over Germany? Will entire wine regions be rendered obsolete? Dr. Grassl had said to me, "If I'm lucky, I'll live another 20 years to see what these changes will be." But if these changes truly come to pass, I wondered, would the wine producers of today—or tomorrow—feel lucky too?